I chose to use a Graphic45 kraft paper I just recently found at Michael's, it was a 5x5 pad, I used my Gears Bigz die to cut the tag, then distressed it with inks and it was good to go. I used the Metallic distress paint on foil in Tarnished brass and then roughed it up good with the Tonic scratcher and pick, so fun! For the inside I used a gears texture fade, but it was a different one than Tim used, I then cut gears out with my Sizzix gear die , I passed some of the dies, which were covered with foil, through the texture fade with all the mini gears. It's got a lot going on, but I like it that way. The word time was spelled out with a combo of mini scrabble tiles and some letter tiles which I picked up at a Vintage Show which took place in San Luis Obispo in November, such fun, so many awesome finds! 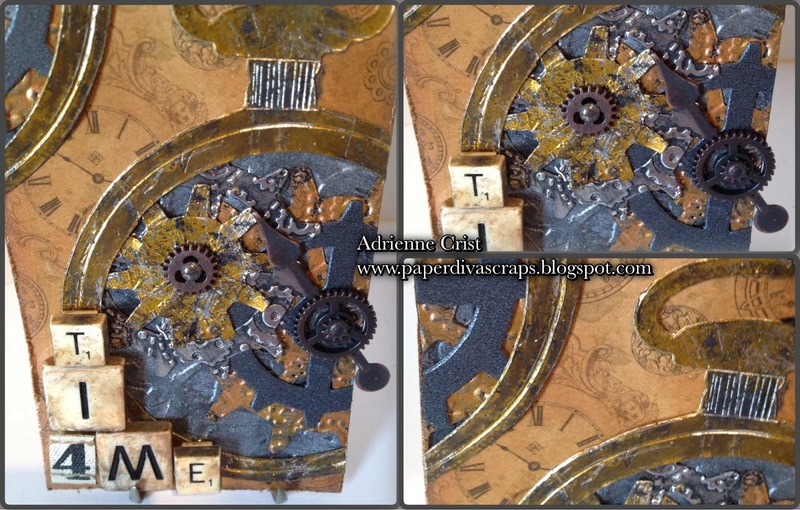 It spells out Time 4 me, the 4 coming from Tim Holtz ruler tape. 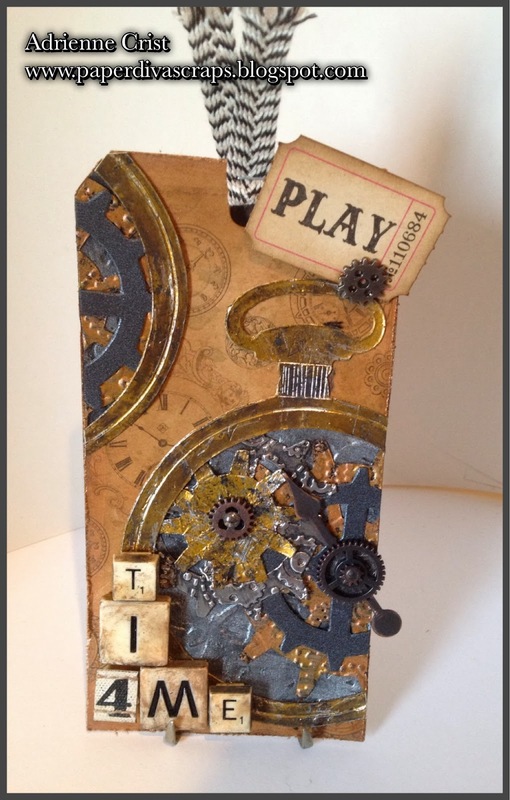 Part of the tag challenge was to incorporate a goal of sorts for 2014, so including the ticket you get "Play Time 4 Me"! Wow, your January tag is really cool. I actually remember Mr Tim's one and I think yours is even better. I am so glad that my post made you laugh....my humour sometimes gets me into trouble I must admit. I am little late with saying thank you for the kind message you left on my blog. I am on holiday so getting on the net has been limited to a few minutes here and there when there is a connection. It meant a lot to me to read your sweet comments - thank you.